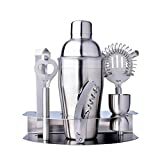 100% high quality Stainless steel 7 piece suit,base,pot(6.3x3in)(7.9×3.3in),Double-headed cup,bottle opener,Hippocampus knife,Ice Tongs,Filter. Doesn’t leak, solid, sturdy, easy to clean, durable. it is guaranteed not to rust or leak and remain on your bar for many years to come! Just keep everything tucked away in the rack until it’s time to make cocktails. In order to prevent the shaker abrasion, to shake when the pot liquid overflow,avoid the rotation of cover and filter layer, and should remain stable and standard action. Perfect for carrying the whole cocktail set to friends and parties. When you equip your apothecary with the best tools and the right ingredients, the details just seem to care of themselves.No matter where you make your home, how you entertain, or what you pour over ice;Standard 7-Piece Barware Set is the best choice for anyone who appreciates top quality and refined style. ·Tools:base,pot,Double-headed cup,bottle opener,Hippocampus knife,Filter,Ice Tongs. Double-headed cup with laser solder joints, is a normal process phenomenon, not rust problem.